(Newser) – Think losing a toe in ancient Egypt meant you'd be forever without one? Not so, at least in one case. 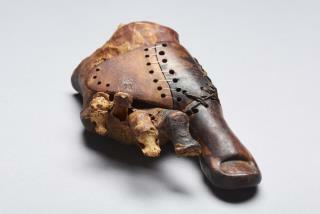 Egyptologists from Switzerland's University of Basel have since 2015 been studying what a press release calls an "ancient Egyptian elite cemetery" near Luxor, and one of its finds was small but big: one of the oldest prosthetic devices ever found, which served to replace the right foot's big toe and was made with incredible skill. The 3,000-year-old prosthesis was discovered in the upper-class tomb of a priest's daughter at plundered burial site Sheikh 'Abd el-Qurna and has now been re-examined. Not only is it attractive and functional, but "the mobility of the prosthetic extension and the robust structure of the belt strap" show it was made by an artisan who was "very familiar" with the human form. Probably useful as well. Walking without a big toe or a good substitute is difficult. It is needed for balance. Being in the privileged class, she could accept the lost of her toe. A poor Egyptian would have been in de-Nile.